Profitez de la vue sur l'océan impressionnante de presque toutes les chambres dans cet océan avant, trois chambres à coucher, 1126 pieds carrés, unité fabuleux! Salon, salle à manger, cuisine, chambre principale et la deuxième offre de Master 'première rangée »des vues spectaculaires sur le bleu du Pacifique, les montagnes de West Maui, Maalaea Bay et les îles de Kahoolawe et Lana'i. De ce condo assister à la beauté et la sérénité du soleil couchant. Écoutez les sons doux de le coucher du soleil annonçant Conque. Endormir en écoutant les sons calmes, rythmiques des vagues de l'océan. La beauté de Maui est partout et affichés directement pour ce condo sans aucune obstruction, comme d'autres stations, condos ou hôtels. Cette unité a tout compris DELUXE CENTRAL air conditionné avec thermostats séparés dans chaque chambre. Aucun bruyants fenêtre unités ici. Juste cool, calme et le confort. Les rendez-vous des vues magnifiques, granit, la tuile et marbre, HDTV dans le salon et mural écrans plats dans chacune des trois chambres ajouter le luxe à la vie facile. La plage est juste à l'extérieur de la porte et étend sur des miles au nord et au sud de l'édifice. Le bâtiment se trouve en face de l'ancien vivier hawaïenne de King Kamehameha et est inscrit site historique. Les relativement calme, les eaux chaudes de l'étang font pour une baignade et la plongée expérience merveilleuse pour les enfants et les adultes. Le vent et l'action passionnante de kite surf, le phoque moine, les tortues de mer et d'hivernage baleines à bosse sont visibles directement de la copropriété. La terrasse sur le toit, avec Weber barbecues à gaz, tables de pique-nique et des chaises longues offre une vue panoramique à 360 degrés sur l'océan, Mt Haleakala et la rive sud de Maui. Les motifs de propriété sont entretenus et impeccablement entretenu. Nager dans la piscine chauffée ou accéder à une petite plage de baignade publique de la porte de côté de la piscine. Situé au cœur de Kihei, emplacement central Menehune Shores offre Voyage de Voyage facile à six golf de classe mondiale de golf, le Maui Ocean Center Aquarium et Port de Maalaea. Les Wailea Resort hôtels, magasins et restaurants sont à seulement 20 minutes. Le port historique de Lahaina est à seulement 30 minutes au nord. Kahului aéroport est à 15-20 minutes de la propriété. The condo was a great place to watch sunsets. It was easy to drive to all of our activities, the favorite ones being the Easy Rider Bike trip down from Haleakala Park and the road to Hana. We enjoyed watching the turtles bask in the sun on the rocks outside of the swimming area, and visiting the Maui Ocean Park. Cannot argue with the beach, view and pool. Location is awesome. Did not feel touristy at all. Condo itself could use some updates. Couch and chaird are just worn out and tired! Really need a real door on the queen bed bedroom door. And that bathroom really does have a funky musty odor. Something is not right in there. Kitchen is small but well equipped. The microwave quit working but was replaced the next day with a new one with no problems at all. Washer and dryer very handy as towel supply is sparse and you will need to wash towels every day if going to beaches and pools every day and with showers. Top of the building has spectacular views and is great for barbecuing and hanging out once in a while. Loved eating on the deck with the views and there was a nice breeze most of the time. The lady with the black hair in the office wasn't always the friendliest and we were ones who had a late late flight and could have benefitted from a late checkout but were told we had to be out by 10 am because new people were coming later so we had to just wander around all day so we were not the fortunate ones who were able to get a later check out. As a matter of fact, later I checked my initial booking and it said 11 am check out but too late now! Overall, it is a decent place for the money and the beach is nice with lots of turtles and perfect depth for people with small children and the pool is nice. I would probably come back. I never talked to Linda personally just via email to set everything up and that seemed to work fine. Thomas H.Where do you live? Our family has visited Maui many times beginning in 1979. This trip was to celebrate our daughter’s wedding anniversary (yes, she was married on a Maui beach 5 years ago). This property is wonderful! 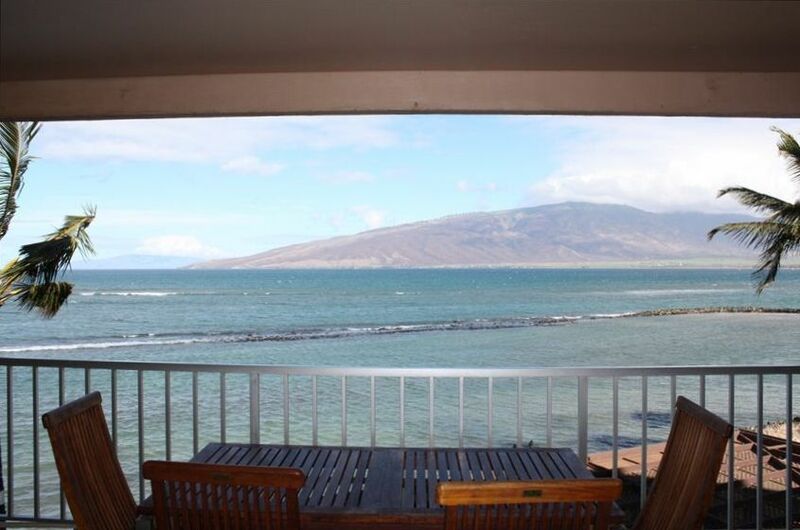 Great location, great views, miles of beach to walk, Menehune fish pond to swim and snorkel in, turtles, and whales! The condo was spacious and accommodating, my sister-in-law claimed it was bigger than her house! Our only complaint was the restaurant remodel and construction work two floors below our lanai from 8 to 4 weekdays. We had to cut our vacation short due to a death in our family, but we’ve already begun planning our return to the Menehune Shores. The overall stay was awesome. The Floors and furniture was extremely dirty. Mattress very uncomfortable and the pIllows were flat,worn and smelly. If you don’t have a bad back or whiplash you will after a night sleep. The last night stay we discovered roaches in the kitchen area. Hopefully the above will be addressed to make other guests stay comfortable and clean. Menehune Shores is a lovely property. We had a fine time, so much was memorable. For purposes of improvement, a few suggestions: change the bedding (pillows, mattress) because they smell funky. and having a clean floor would have been terrific, my white socks will never be white again. BUT OVERALL EXPERIENCE WAS GRAND. We look forward to a return. Perfect Spot! Perfect for a group of 6. The picture of the unit do not convey how nice it is. Everything is very clean, well cared for and updated. The deck and view of the ocean is worth it by itself. Our group was grandparents, parents and two kids (15 and 11). There is a shower in the master suite and a shower/tub between the second and third bedrooms. There is a bit of a step to get into the shower/tub combo, which was an issue for the seniors with us. They used the bathroom in the master instead. The kitchen is clean and adequate. Pans, utensils and other items needed to prepare a meal were better than expected. Full size fridge and dishwasher. Can cook all meals here, but make sure to purchase things like salt and pepper, oil, etc. Televisions are all state of the art with beautiful HD. The unit had a couple of beach chairs, beach towels and came with a new cooler. The unit was quiet in the evening and of a normal noise level during the day. There is a restaurant immediately beneath you, but it wasn't an issue for us. The property is well conceived and has good access to a beach, pool, shuffleboard and grills. Beautiful rooftop to take in the sunsets. Parking was tight but adequate and we didn't have a problem getting passes for two cars. Linda on the phone was amazing and accessible. The on-site condo manager was very useful. Amazing overall location. Could get to anything on the island within about 45 minutes. Kihei area is a little more "chill" than the resort areas. Awesome places to get breakfast (Kihei Cafe! and Sugar Beach Bake Shop for Malasadas! ), low key meals and groceries are all within a minute or two. Area open public beaches visible from road with easy access are mind blowing (best in the world?) So many rentals are not "what you see if what you get". This one is better. Will stay again if we ever decide to visit Maui again.